Would you like to get more possibilities? Try with us the new format of email-marketing and make sure in conversion increase by yourself. Up to April - registration and use of the system is absolutely free, with no hidden limitations. Look through our most important advantages that will help you, before the start of using the service, just get acquainted with it and understand that we are the best of the existing competitors in the market. Track each subscriber in BeeSend system. You will always be able to find out if your mails were delivered to subscribers. Openings, clicks, returns, complaints are automatically recorded and visualized using interactive graphs & data tables. Various types of reports will give you a lot of useful information that will help to improve future campaigns. Мы предоставляем Вам возможность разместить форму подписки на Ваш собственный сайт, для того чтобы сбор подписчиков происходил еще проще. То-есть, после создания списка рассылки, Вы можете создать и настроить форму подписки по полям и стилям, после чего – вставить ее на свой сайт. Facts, suggesting why e-mail marketing is so effective and why you should not think it a spam, and consider it as one of the main marketing tools for your company. In most cases conversion is effected sales, particularly concerning electronic commerce; it means any action carried out by emails. For example, a mails subscription, downloading a mobile application, filling in a survey, etc. Conversion rate is the percentage of receivers who have completed the necessary action after clicking on the link in the email. Email marketing is a tool of great lead generation and active orders. Mailing allows to focus attention and to engage a potential customer in the conversion process. It does not offer the customer to buy something immediately, but invites him/her to get acquainted with the product. Thus, the conversion of interested people is increasing significantly. The average profitability of investments in e-mail marketing campaign is $ 44.25 per every invested dollar. Only a short time ago such marketing tool as Video entered the life of emails. Creation of Video-mails is moving into top gear and we can see that for last 3 months the statistics of conversion has increased on 19 percent averagely. And it is more than in case of using the contextual advertising. There are pre-installed templates with blocks for faster creation of mails in the system. 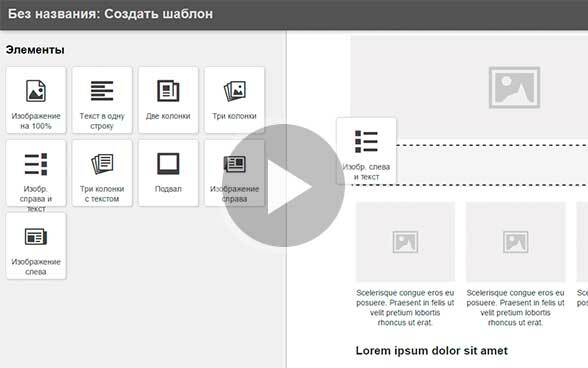 By the aid of drag-and-drop blocks, such as: text, picture, video, 2 columns with text, lists, mails footers, and mails headers - you can make any template by your unique format easily. Also - if you have your own developed template - you can download it directly into the system by clicking on the "Existing template" in the control panel. If you, after information review, still have any questions to our team – just ask them in the form below and we`ll suggest you how to be more successful and to "strike out" your goals in business promotion. Copyright © 2007-2017 | Beesend | All rights reserved.